United States of America. October 15, 1933. 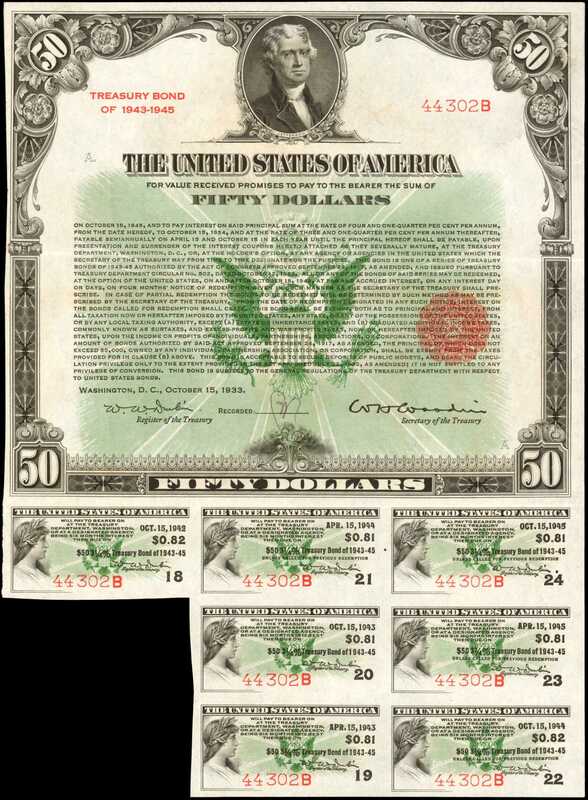 $50 3-1/4% Treasury Bond of 1943-1945. Issued. Extremely Fine.During the 1930s there were several issues of lower denomination coupon bonds for public purchase, but they were less popular than during the patriotic fervor of the Liberty Loan program. Many of these "between the wars" bonds were bought by municipalities and many that still exist came from those sources (the State of Ohio is an example). These are all scarce and attractive, but they did not vary the face colors between the different denominations; the back colors with the title panel did. This bond had a relatively short term. Some of the following types were due in the 1960s. A long style coupon bond by the BEP, 7 of 24 coupons remain. 20.5cm by 17.5cm excluding coupons under. The common style observed on this series. Green sunburst across bottom of bond with very dark green Great Seal of the United States. Jefferson top center, bond type to left. Red Treasury Seal. Engraved signatures. Brown back with panel and vignette of standing Justice and globe. Embossed Treasury Seal. Choice, bright, vibrant and appealing. There are some petty staple holes and pencil notation on back.1990 Memphis Sale, #89, (Smythe, lot 2579 at $625).